Arpwatch is an open source computer software program that helps you to monitor Ethernet traffic activity (like Changing IP and MAC Addresses) on your network and maintains a database of ethernet/ip address pairings. It produces a log of noticed pairing of IP and MAC addresses information along with a timestamps, so you can carefully watch when the pairing activity appeared on the network. It also has the option to send reports via email to an network administrator when a pairing added or changed. This tool is specially useful for Network administrators to keep a watch on ARP activity to detect ARP spoofing or unexpected IP/MAC addresses modifications. 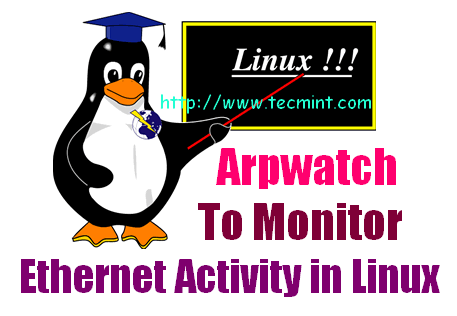 By default, Arpwatch tool is not installed on any Linux distributions. We must install it manually using ‘yum‘ command on RHEL, CentOS, Fedora and ‘apt-get‘ on Ubuntu, Linux Mint and Debian. Let’s focus on the some most important arpwatch files, the location of the files are slightly differ based on your operating system. /etc/rc.d/init.d/arpwatch : The arpwatch service for start or stop daemon. /usr/sbin/arpwatch : Binary command to starting and stopping tool via the terminal. /var/arpwatch/arp.dat : This is main database file where IP/MAC addresses are recorded. /var/log/messages : The log file, where arpwatch writes any changes or unusual activity to IP/MAC. 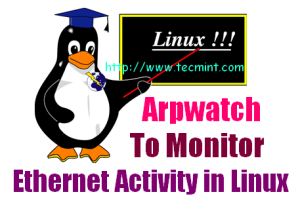 Type the following command to start the arpwatch service. To watch a specific interface, type the following command with ‘-i‘ and device name. So, whenever a new MAC is plugged or a particular IP is changing his MAC address on the network, you will notice syslog entries at ‘/var/log/syslog‘ or ‘/var/log/message‘ file. The above output displays new workstation. If any changes are made, you will get following output. You can also check current ARP table, by using following command. If you want to send alerts to your custom email id, then open the main configuration file ‘/etc/sysconfig/arpwatch‘ and add the email as shown below. OPTIONS="-u arpwatch -e [email protected] -s 'root (Arpwatch)'"
Here is an example of an email report, when a new MAC is connected on. ethernet vendor: GIGA-BYTE TECHNOLOGY CO.,LTD. Here is an example of an email report, when a IP changing his MAC address. As you can see above, it records, Hostname, IP address, MAC address, Vendor name and timestamps. For more information, see the arpwatch man page by hitting ‘man arpwatch’ on the terminal. not recommend to use arpwatch on VPS or shared network because it opens the promiscuous mode by default which lets attacker sniff all packets.